It’s like a page out of paradise where I can lie in a cabana by the pool, looking at the ocean, soft salty breezes in my hair and someone bringing me tropical drinks. 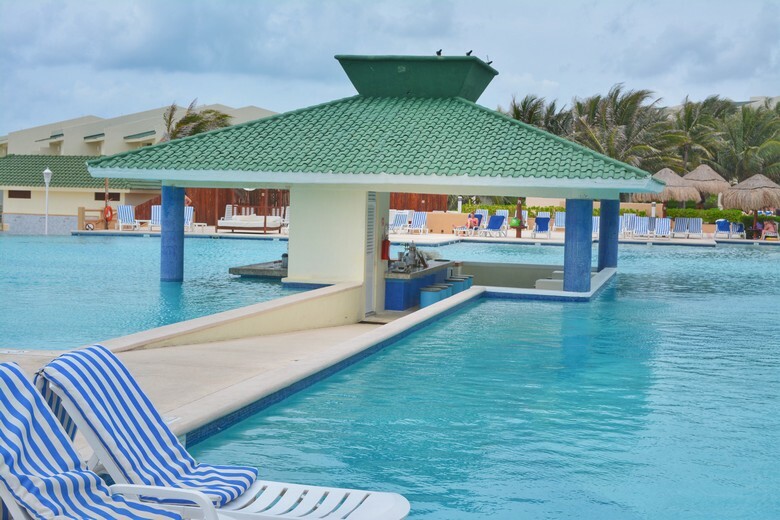 If I’m feeling particularly active, I can jump into the pool and sit at one of the swim-up bars. If I want to get dressed up and go for a fine dining experience, then followed by live entertainment shows. 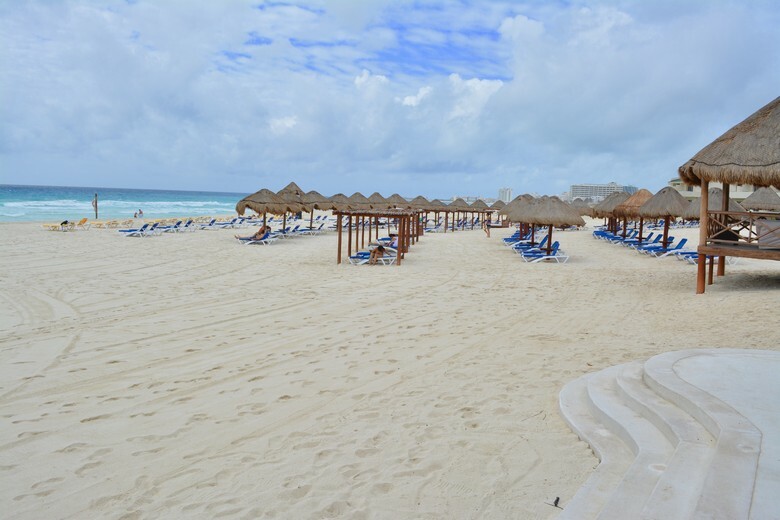 Or I can grab quick bites and be on my way to play golf, parasail, grab a game of beach volleyball or lay on the pristine white sand beaches of Cancun. 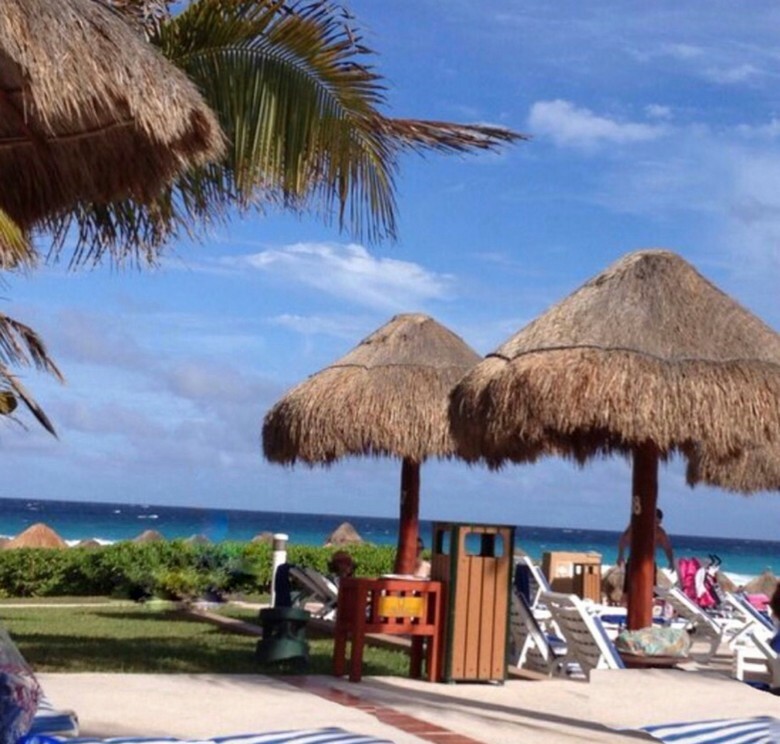 Here’s what I did do during my luxury 5-star vacation at the all-inclusive Iberostar, Cancun. I ate. I ate a lot. Really good food, but being all-inclusive you may need to make reservations or watch the dining hours. If you’re dozing by the pool and miss a meal, well, you miss a meal. We signed up to parasail, but it was too windy, and I didn’t realize all of the private spa services they offered (including a massage on the beach) until those were also fully booked. They have a children’s camp for daily activities., but mine were happy just to stay with us and swim in the pool, then run and swim in the ocean, then swim in the pool, then the ocean. For adult activities, I went target shooting for the first time annnndddd I sat in the cabana and had many, many drinks brought to me. This was the first time I planned a vacation that wasn’t around kid interests. I really wanted to give the girls the experience of going out of the country, and we took a day to go into the city of Cancun and explore. It was a nice way to have us all take the first step outside the US borders and still feel like we had some comfort zone traveling with young kids. It was also a much-needed vacation for me, where I wanted to do a lot of nothing, but in a way I felt relaxed, pampered and really not have a care in the world. It was what I considered to be a “Mom’s Vacation” where I didn’t have to worry about being anywhere, cooking, planning and had the ideal luxury lifestyle, at least for the 5 days we were there. The weather was windy, as you can see in the photos, which I appreciated or it would have been humid. It would start out cloudy every morning, but by noon the sun would be out. These were some of the richest blues and turquoises reflected in the sky and the ocean. As a special treat for the kids, I arranged an excursion off property to do the bucket list item “swim with dolphins.” I’ll be honest, it was cool, but not what I expected. There is a small secluded lagoon where the dolphins are kept and it didn’t seem like they had enough room. I was so excited to be that close to these beautiful and amazing animals, but I also felt sorry for them. I couldn’t help but imagine the lives of these majestic creatures now stuck doing the same tricks over and over for tourists. It happened to be raining and cold (incredibly cold) that morning and when we arrived and saw the experience was not what we pictured in our heads, the kids were reluctant to go in. Also, one thing they won’ tell you is that the odor of the lagoon is incredibly powerful. We were also in the freezing cold water for a long time, as you go as a group and each person takes a turn having the dolphin perform tricks. The time we spent in the water was over two hours. As the sun kept trying to break through the clouds, I ended up with a lovely pink sunburn. Amazing experience, but left me with a little more regret than wonder. So we headed back to the Iberostar. Honestly, if I could, I would never leave. Looking forward to coming back one day and now that we know what we can experience on property, if I need another luxury “Momcation” we may try another location. We welcome any comments or suggestions for all-inclusives you recommend in the comments below!